decanter and set of four Sherry glasses on tray. Condition is Used. Dispatched with Royal Mail 2nd Class. It weighs 645g unboxed, the pictures do not do this set justice, its a stunning set, I think it would be a super addition to any table, drinks cabinet or Bohemian/Czech glass collection. Full lead crystal. With a selection of crystal glasses and a silver (plated) tray. 700ml empty glass decanter, Avengers logo engraved on front. Marvel Avengers inspired. Perfect gift for any Avengers loving fan; all beautifully engraved. thick, heavy squarish clear glass with rustic style conical cork stopper. Add a splash of panache to any affair with this Seasons Crystalline Decanter Set from Royal Doulton. 6x Tumblers. 1x Decanter. Decanter Capacity: 750ml. Crystalline Glass. Not suitable for dishwasher or freezer. Rennie Mackintosh Glass Decanter And Glasses Set. Condition is Used. Dispatched with Royal Mail 2nd Class. 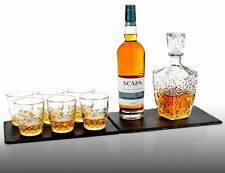 The stunning Quadro decanter set 850ml and two 340ml tumblers. This Quadro decanter can also be engraved to really personalise it. Made of the highest quality Bohemian crystal glass. Crystal Glass Decanter Set "Quadro" 850ml & 340ml Tumbler. 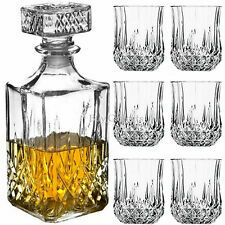 Argyle fine cut crystal decanter set (whisky). New and boxed. Whisky Decanter Gift Set. Includes a decanter and 2 tumblers. Decanter capacity: 1 litre (1¾ pints). Elegant lustre finish. Set of two glasses: 350ml (11.8 fl oz). Out account details are as follows: Sort Code 12-24-82 Account Number 02269299. This decanter and four traditional sipper glasses would make the perfect gift for any serious Port lovers! Set of four Port Sipper Glasses. Port Decanter Set. Port Decanter 29cm x 12cm. Get In Touch. Holds a whole bottle of wine. Particularly good with red wine as you can really swirl the air in to it.